Time travel stories have always fascinated readers--myself included--replete as they are with multiple conundrums and endless "what ifs". Aware of their basic appeal, DC Comics once based an entire series on a time-hopping adventurer back in the early sixties. 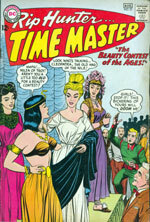 Though ultimately a mere footnote in the history of the medium, the century shifting Rip Hunter chalked up 29 issues of his own title--after four trial appearances in SHOWCASE--between the years 1961 and 1965. Thereafter, he was quietly relegated to B-List limbo, patiently awaiting his chance to return in a more modern setting. He eventually did, but that doesn't concern us one whit here today. Nosirree, not with such historical honeys as Cleopatra and Helen of Troy in his care, each attempting to out-diva one another!?! Written by Jack Miller in the wake of the then-topical Liz Taylor-"Cleopatra" debacle, the plot of this potentially intriguing story starts out quietly enough on a Hollywood back-lot. A beret bedecked film director, in full visual cliché-mode, avails upon Rip Hunter to help garner publicity for his latest epic. A Marie Antoinette biopic, our cigar-chomping auteur figures that by staging a beauty contest between the most desirable women throughout all of history AND his star actress, Liz Traymore, he'll have the public buzzing about his latest project. Rightly rejecting this self-serving notion as having absolutely no scientific merit, the naive Time Master is eventually persuaded to arrange the pageant when promises are made to donate twenty percent of the blockbuster's profits to Rip's favorite charities. (...Let's not even consider Tinseltown's creative accounting practices here, okay?...) As Hunter heads off to the Time Sphere to alert his crew of their latest--and highly dubious--mission, the chortling DeMille-wannabe whispers to an associate that he fully plans to rig the voting, making sure his gal out-ranks the lovely lasses of legend!! Sound stupid enough for you yet? Well, folks, that's just the set-up! Yes, it was a tremendously dumb story, no doubt about it. Worse--the cover was deliberately misleading. Oh, that scene certainly appears, but see that line of dialog our hero spouts? About being doomed if the "girls"--as he so casually refers to this collection of distaff royalty--don't stop their bickering? He never--I repeat, NEVER--says anything even close to that inside the book. Nope. The ONLY thing their non-stop kvetching is gonna doom him to is the mother of all headaches, lemme tell ya!?! 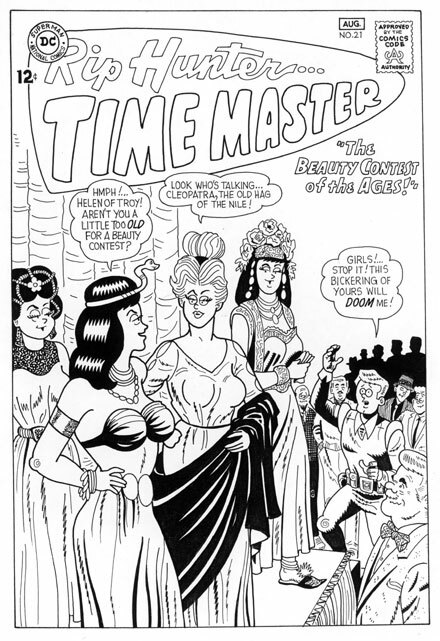 And while artist Bill Ely did an acceptable job bringing these legendary lovelies to life, one can only imagine what the exact same story would've looked like if it had been drawn instead by someone the caliber of, say, Wally Wood, hmm? The mind boggles at the notion! One thing for sure--if the wondrous Wally had been at the drawing board, no one would've cared about this tale's glaring deficiencies, because believe me, brother, no one would've NOTICED!?! Hubba-historical-hubba! !